Do you believe that the introduction of the Bus Rapid Transit system by Government will solve the traffic mess in Nairobi? View results for:	 Select poll from the list Example poll question goes here Do you support the High Court ruling outlawing the Constituency Development Fund (CDF)? Do you support the push by Senators for Counties to be allocated more funds through the Division of Revenue Bill 2015/16? Do you support the move by the National Assembly to sack the Ethics and Anti-Corruption Commission secretariat bosses? Do you support the move by Government to rule out a pay rise to teachers? Should the Transition Authority term in office be extended beyond the three years? Do you think Uber should exit the taxi Industry in Kenya? Do you support the call for disbandment of Independent Electoral & Boundaries Commission (IEBC)? National Cohesion and Integration: Is Kenya headed in the right direction? Do you believe that construction of more roads will ease traffic congestion in Kenya’s Urban Areas and Cities? Do you support the capping of bank interest rates? Do you believe the Government is committed to the fight against corruption in Kenya? Is the Government doing enough to address the current drought situation? Is Kenya’s economy headed in the right direction? Is the Government doing enough to address the high cost of living in Kenya? Do you support Salaries & Remuneration Commission decision to cut salaries for top state officers? Are you satisfied with the way the Independent Electoral & Boundaries Commission (IEBC) managed the just concluded general elections? Do you think the Independent Electoral & Boundaries Commission (IEBC) is ready for the repeat of the Presidential poll on 26th October,2017? Do you think the repeat Presidential polls were free and fair? 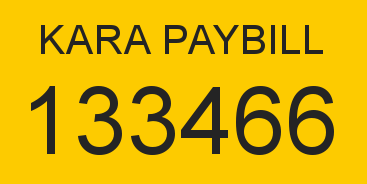 Have you registered to attend The 2nd Kara Business Expo & Conference from 1st -3rd December at the Sarit Centre? Have you registered to attend the 2nd Kara Business Expo and Conference to be held at the Sarit Centre from 1st to 3rd December, 2017? Do you support the implementation of the new electricity tariff that will purge subsidy for small consumers ? Do you think that the government’s Big Four Agenda will improve Kenya's economic outlook? Do you believe that the introduction of the Bus Rapid Transit system by Government will solve the traffic mess in Nairobi? Do you believe that the government is committed to fight against corruption in Kenya? Do you believe that poor land use threatens the affordable housing agenda in Kenya? 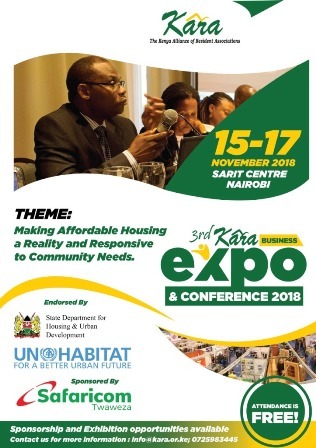 Have you registered for the 3rd Kara Business Expo & Conference event to be held on 15th -17th November 2018 at Sarit Centre? Do you think the government’s Big Four Agenda will improve Kenya's economic ? Do you believe government’s Big Four Agenda is achievable by 2022? Do you support the introduction of car free days in Nairobi CBD to decongest the city?